The Hitachi KM12VC features a smooth-starting, solidly-built 11-amp, 2-1/4 HP motor that handled any task I threw at it. The unit comes with a hard-sided case that holds both bases plus accessories, and it features a longer than average power cord. However, it lacks a number of professional touches that exist on comparable models, and the collet is a bit far from the base in the lowest position, which makes for some difficulty when used in a router table. All-in-all, the Hitachi KM12VC Router kit is a good value for the price, but professional users will miss the features found in competing products. Plunge base is stable and comfortable to use. Fine depth-adjustments are smooth. Bit changes require two wrenches, a bit more traditional than some comparable models. Depth adjustment on the fixed base requires turning the motor in the base. It felt sloppy, a bit difficult to fine-tune. Product manual is well-organized, although documentation on the plunge base felt like somewhat of an afterthought. The hard-sided case is roomy, with space for the entire kit as well as after-market accessories. Includes motor, case, plunge and fixed bases, three wrenches, collets, centering gauge and guide adapter. In the KM12VC, Hitachi engineers have provided a very solid 2 1/4 HP variable-speed motor that started smoothly and handled any task I threw at it. It also seemed a bit quieter than other comparable motors. The plunge base functioned quite well, as fine depth adjustments were simple and the thumb-release lever was easy to reach. The adjustment knobs were oozing with grease, which looks a bit unrefined. The fixed base seemed a bit narrow and the motor looks like it was positioned somewhat higher than comparable models. This gave the feeling that the unit was somewhat unbalanced. 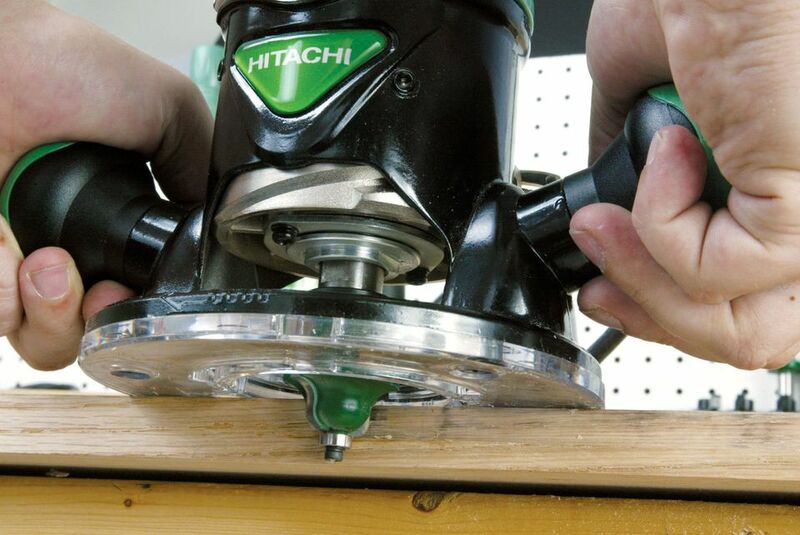 Also, keep in mind that when the router is in its lowest position on the fixed base, the collet is too far from the base, meaning that some router bits cannot be seated properly in the collet when mounting the router with the fixed base in a router table. While using this router in a router table, I broke the shank of a straight-cutting bit simply because I couldn't seat the bit deeply enough in the collet. Considering the price, this router kit provides a good value. I put the router through a number of projects, each of which it handled admirably and relatively quietly (at least, as far as routers go). However, I couldn't escape the feeling that, while I was satisfied with the results I achieved, I didn't have a comfort level that I was able to find with other models. Perhaps if the engineers were to provide a bit wider fixed base and set the motor lower in the base, as well as switch to a single wrench bit change and do something about the grease issue, my comfort level in using this tool would increase.